Episode 18: Page Layouts, or what’s with all these dots? Angela and Kelly take a deep dive into comics minutiae this week with a discussion about the nitty gritty of page layouts. Angela can’t understand why every panel in manga doesn’t have detailed backgrounds. Kelly can’t understand why Angela doesn’t appreciate negative space. Kelly thinks comics move too fast. Angela worries about getting enough action for her $3.99. Also, a discussion of Rachel Thorn’s fascinating thread on traffic laws in manga panelling and whether comics need similar guidelines or are better off without them. We all love some kind of fiction with elements that might be considered, well, problematic. Age-gap romances, dubious consent, uncomfortable tropes and outdated stereotypes, sexual objectification, an author with bad behavior or objectionable views—you name it, it’s in one of our favorite books or shows. 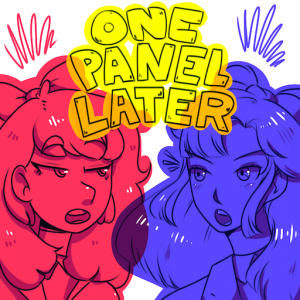 Kelly and Angela talk about liking things we feel pressure to censure in spite of ourselves, from Devilman Crybaby and the infamous Land of the Lustrous Tumblr post to Lois Lane, Rawhide Kid, and beloved 90s books like Ender’s Game and Rurouni Kenshin.